On October 24, 2017, Charlie was left for dead in a pile of trash in Southwest Philadelphia. Three weeks later, he's shown great signs of recovery. Three weeks ago, his life was saved when random passersby noticed him laying amid a pile of trash near the Cobbs Creek Recreation Center. 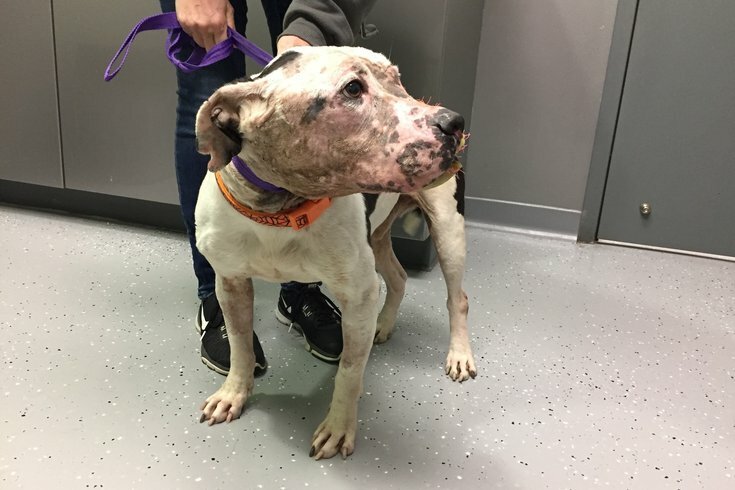 On Tuesday afternoon, though, Charlie excitedly wagged his tail as he approached a pair of visitors, greeting them with hello licks in a Philadelphia Animal Hospital examination room. That’s where the 2-year-old pit-bull mix has been recovering since October 24 when the discovery of an innocent pup – abandoned after being used as bait for fighting dogs – brought a community together. 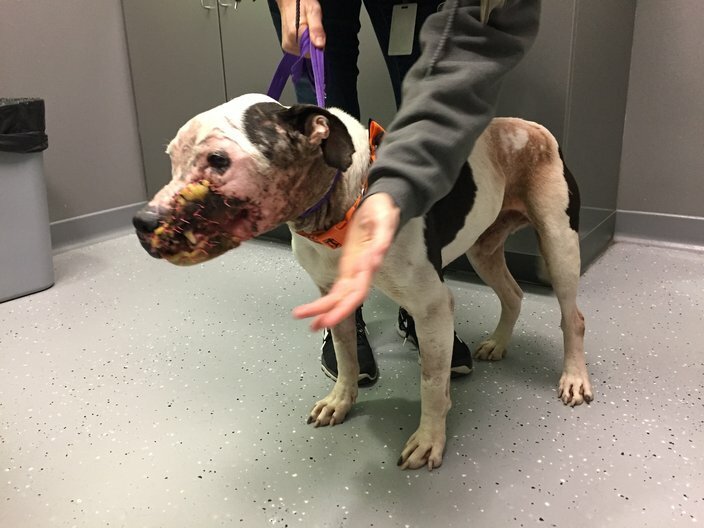 While a Pennsylvania Society for the Prevention of Cruelty of Animals spokeswoman said charges have yet to be filed in the case, Charlie had a microchip implanted, so the dog’s supporters expect that could soon change. From a recovery standpoint, things are going well, said Dr. Kimberly Lockhart, who’s been treating Charlie during his stay in Southwest Philadelphia. Early on, there were concerns about a bacterial infection getting into Charlie’s bloodstream and leading to sepsis. While those concerns linger to a certain degree, Lockhart said Charlie has made remarkable strides. The left side of Charlie’s face and mandible still lacks skin, so a special bandage has been stitched on – and changed once a week – to help promote growth. It is Lockhart’s hope that enough progress can be made that skin can be grafted on those areas. A specialist would have to handle that procedure, which goes beyond the scope of day-to-day veterinary care. Left for dead near the Cobbs Creek Recreation Center, veterinarians are trying to help the face of a 2-year-old pitbull mix heal enough to make a skin-graft procedure possible. She said Charlie is “not completely out of the woods” in regards to the fears of sepsis, but positive signs include weight gain and improved strength with each passing day. Visitors, including those who found him near the rec center and with City of Elderly Love, have helped. “He couldn’t care less” about the sorts of bandages that would have other dogs trying to remove them with their paws, she said.